ANSWER was formed by those who felt that the Bush administration would use the attacks on Sept. 11 as a pretext for new wars abroad and racist repression at home against Arab Americans, South Asians, Iranian Americans and the American Muslim community in general. Ten years later, the U.S. is engaged in wars and occupation in Iraq, Afghanistan, Libya and Pakistan. The policies of Bush have become institutionalized and maintained by the Obama administration. 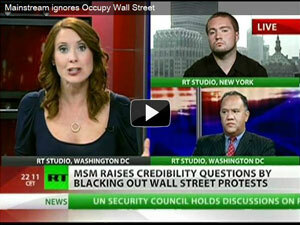 Watch ANSWER activist and hip hop artist Marcel Cartier discuss Occupy Wall Street on RT Television. Only the bankers, oil monopolies and military corporations thrive as this society’s vast wealth is squandered on war and destruction. But people are fighting back. A new movement is arising. It is a global movement of protest, rebellion and resistance. This is the source of optimism and hope. 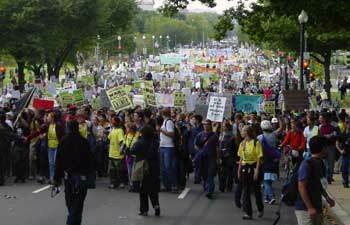 Ten years after its first action, the ANSWER Coalition continues to mobilize, educate, build and coalesce with others who are fighting for radical change. We have also trained a new generation of organizers and leaders who function in cities throughout the country. The training of new generation of talented, skilled and dedicated organizers is a cornerstone of our ongoing work. These young people are organizing in their workplaces, schools, communities and for a growing number inside of the U.S. armed forces where they are the soldiers and marines who have been sent in endless deployments in brutal wars for empire. Marcel Cartier, is one of many young ANSWER organizers in New York City. He is part of the movement that is occupying Wall Street. Check out Marcel Cartier's television interview on RT that gives a clear voice of ANSWER’s program that connects the dots between war, racism, police brutality and the staggering unemployment faced by young people. During the next week the ANSWER Coalition’s organizers and volunteers are doing what we do every week—organizing and mobilizing for a vast number of activities in numerous cities. Occupy LA in downtown Los Angeles. Join ANSWER to raise demands that connect corporate greed with the wars, unemployment, racism and immigrant rights. LA Protest & Die-In on the 10th Anniversary of the Afghanistan War. A list of national actions below. For more info on these actions: 213-251-1025 or answerla@answerla.org. Your support over the past decade has made this work possible. Please make a generous donation now to support our ongoing work. You can also become an ANSWER monthly sustainer for as little as $10 / month by clicking here.